This morning’s flight to Panama City was delayed 30 minutes. Why? I don’t know for sure, but Denise guessed that the airline tells everyone an earlier flight time to get the locals on their flight. You see there is no time on this island, and things just happen when they happen. You need a boat taxi, no problem just a minute, which means maybe in the next 15 minutes. Service in most of the restaurants is not what we are used to in the States. The waitress takes your order and in time you get everything. It takes some getting used to, but last night at dinner we waited 10 minutes to get our beers and we hardly noticed. I think I’m getting used to island time. 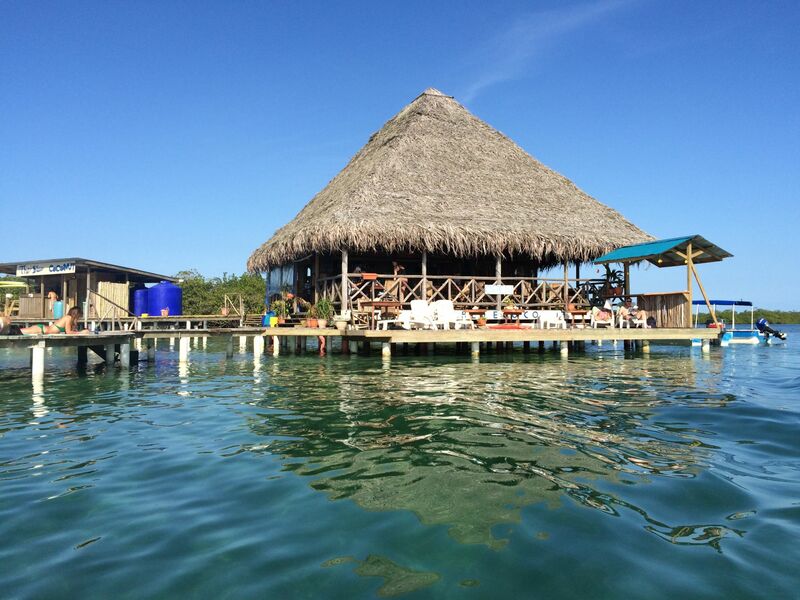 Yesterday we spent our last day in Bastimento, Panama, at a restaurant called Blue Coconut. It was nothing short of paradise. Blue Coconut is on its own island, around 6 acres and the restaurants holds maybe 50 people, but our bartender said there are times they have over 100 patrons, He said when this many people show up they stay on their boat and it becomes like a floating Sonic with adult beverages and Jimmy Buffet blaring over the speakers. We snorkeled around the docks and found a fish that looked like a long bottle about 3 feet long, hence its name bottle fish. Paddle boarding was an option, but sunbathing and snorkeling were good enough today. On our way to Belize we had a whole day in Panama City because there were no flights until the following day. Our new friends at The Firefly (our hotel in Bastimento) recommended Old Town in Panama City. Old Town, also known as Casco Vieja, is where the original city was and is now being restored. This is a great place to stay for the night. Our host was from Florida and his hostel/hotel was Magnolia Inn. We spent the day walking around the whole city stopping in restaurants and cafes for snacks and drinks. Our lunch was at their version of Fisherman’s Wharf, which was a few blocks in size and had everything under the sun to bring home to cook and/or vendors making fresh ceviche and fried fish. We indulged in both ceviche and a whole fried fish with a couple of Panamanian beers. There was Central American music blasting on the sidewalk and American basketball on TV, pinch me I think I’m dreaming. We had a light dinner on the rooftop of Tantalo, which is a hip hotel with an ultra cool bar and restaurant on its roof with a picture perfect view of Panama City. Flight #20 took us to San Salvador where we changed planes and awaited flight #21 to our final destination, Belize, before heading home to the States to visit family and friends. We’ve been all around South and Central America and one thing is for sure — you can’t imagine the friends you’ll meet from all over the world, from the police officer helping me get stitches at 2am in Mendoza or a student from China who speaks 8 languages showing me the stars in Chile. Thank you to the couple from London on their honeymoon that we met on our first stop in the Amazon – they started our trip off in the right direction — and to another couple from the UK who invited us for drinks and some barbecue last night. All I can say is God bless humanity! Amen!!! Good people are everywhere…sometimes you just have to look a little harder….most of the time on your trip, they have found you! It’s good to have an end to journey toward; but it is the journey that matters in the end…..
sounds like U two are having the time of your lives, enjoy & be safe.